Hailed as "the Sultan of Duende" and already an international sensation, Spanish-born flamenco guitarist Vicente Amigo won the Latin Grammy in 2001 for Best Flamenco Album for his BMG debut City of Ideas. Like Amigo’s first three albums, it has won him new fans in his homeland and across Europe, as well as in South America and Japan. Windham Hill/RCA will introduce the guitarist to American audiences on August 6 with the first U.S. release of City of Ideas, an expansive East-meets-West affair that combines the solea rhythm of puro flamenco with elements of buleria, bolero, rumba, tango and alegria. Over the past decade, Amigo’s incredible global appeal has given him the opportunity to perform in many parts of the world, from the Far East to Cuba, Morocco and Tunisia to South America. From his childhood in the little village of Guadalcanal, Spain, the guitarist has been a great student of culture. His exposure to a wide range of musical expression and rhythmic possibility has allowed Amigo to expand beyond his trademark "roots of flamenco" approach to incorporate a mix of what he calls "other feelings, outside roots." As its title implies, City of the Ideas finds Amigo expressing an open heart to a dynamic "world of mixes." "Studying" in this ciudad led him to discover that, as a race, we are about more than just one thing – in all ways, but especially musically. "I love flamenco music as a foundation because it allows me to tell a story in a very different, non-linear fashion," says Amigo. "The organization of that tale is less important than the feeling of it. I can start at the end or the beginning and explore and insert many themes upon the main theme, adding little messages along the way. There can be many hidden meanings within the main storyline as I change melody and harmony. There doesn’t have to be a specific ending. It’s just a matter of following my soul when I find something good to express in the song." In the early stages of recording, Amigo became enamored of a classic Greek poet named Kavafis and especially a poem entitled "The First Step." "The piece is about an old poet in conversation with a young poet. The youngster brags that he’s written a masterpiece that can never be surpassed, but the older man puts him in his place and tells him he has so much to learn, that such talk is foolish. The young man eventually realizes the wisdom of this and says thank you. With City of Ideas, I related to the young poet, opening myself up to new experiences and new influences. Each song is like a big ‘thank you’ to all the life experiences I’ve had to draw from. I see music as a realm with no frontiers and each project allows me to explore even further." While Amigo’s strings are always front-and-center, City of Ideas features many notable outside performers – vocalists Khaled, Pedro Aznar, Dieguito "El Cigala" and Montse Cortes (with Amigo peforming some himself); bassist Alfredo Paixao; drummer Mino Cinelu and percussionists Tino di Geraldo, Chaboli and Echegaray Street. Recorded at the Filigrana Studios in Cordoba (Amigo’s adopted hometown) and mixed in Madrid, the collection is orchestrated and conducted by Joan Albert Amargos. The first international single from City of Ideas was "Tres notas para decir te quiero" ("Three Notes To Say I Love You"), a folksy, loping romance with a few splashes of subtle brass. To Amigo, these three notes carrying all of his music are the rhythm, the melody and the indefinable spirit he simply terms "the natural flow." "La Tarde es caramelo (Alegrias)," or "The afternoon is sweetness," is happy, upbeat and intensely percussive, blending elegant strumming and dreamy vocals with irresistible handclaps and a lush harmonica solo by Antonio Serrano. "Ojos de la Alhambra" ("Eyes of the Alhambra") is a soulful, Eastern-influenced meditation on the Spanish city of Alhambra, the last Arab enclave in Spain, located in the larger city of Granada. "It’s a magical place for me, where I could imagine the eyes of the city watching as I composed the song in its honor," says Amigo. Amigo’s guitar swirls with a call-and-response pattern of voices on the joyful tribute song "Compare Manuel (Tangos)" ("Manuel My Brother"), which is dedicated to a close friend’s godson. Amigo makes a special dedication also to his son, Vicente Jr., on "Bolero de Vicente" ("Vicente’s Bolero"), a playful improvisational number played solo with the occasional percussive slap. "Tata" is a meringue flamenco piece that begins with sparse guitar and handclaps and comes to incorporate tribal drumbeats, breathy wordless vocal passions and increasingly manic string explosions. The fiery, energetic fiesta "Cordoba" is Amigo’s showcase of the intricate, quick copla flamenco style. "This is a very personal vision of my home, letting everyone know that this place is united with my heart," he says. "I am there in every old street, where I feel a pulse and inspiration in my soul. It’s a place that I always draw great comfort and new ideas from." The title track closer plays like a graceful film score from a dusty romantic Western. Amigo’s laid-back playing is enhanced by the gorgeous, lonesome harmonica longings of Antonio Serrano. Vicente Amigo has been called by some fans "the natural continuation of Paco de Lucia," and indeed it was a television performance by the legendary flamenco master which inspired Amigo, all of three years old, to visualize his future playing that instrument in that style. Still, he says, "I believe that flamenco has always been something for adults, not just for children. To understand flamenco, you need maturity. You can play the guitar as a child. You understand the technique. But the essence of flamenco is something that requires maturity." Amigo draws that notion from experience. He began playing at age eight, after falling in love with the sound of a beloved neighbor playing the guitar. He learned from several legendary performers, including Juan Munoz and Merengue de Cordoba, and by fifteen, he was attracting attention as the protogee of Paco Peña. He spent six years playing in a band with Manolo Sanlucar and then worked with the legendary Camaron de La Isla. 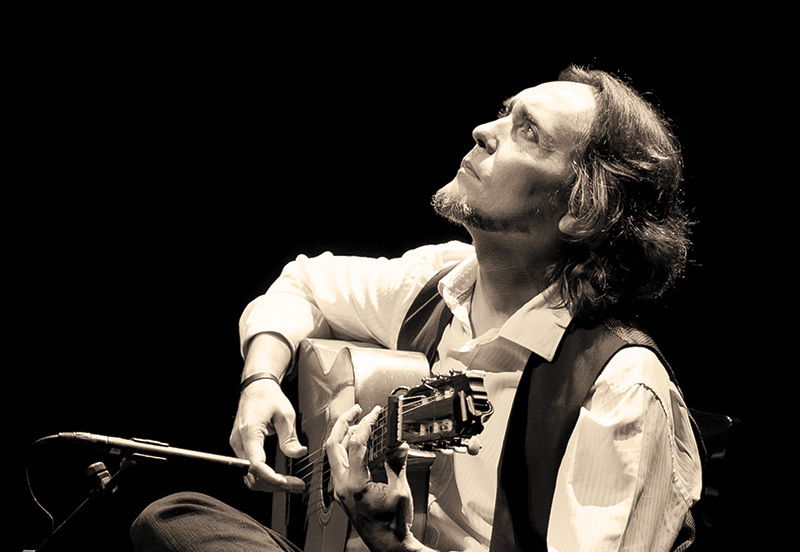 Towards the end of the eighties, Amigo was receiving various awards from the flamenco world for his solo performances; his breakthrough came in 1991 when he shared the stage with de Lucia during the international guitar festival "Leyendas de la Guitarra" in Seville. Other participants were Bob Dylan, Keith Richards, Phil Manzanera, Joe Cocker, Jack Bruce and Richard Thompson. That same year, Amigo recorded his debut solo album De Mi Corazon al Aire, which received two media awards. Pat Metheny quickly called him the greatest player of the Spanish guitar, and Guitar Player magazine named him Best International Flamenco Guitarist. In Martinica ’92, he shared the stage with Stanley Jordan, an international collaboration led him to work with artists such as Milton Nascimento, Wagner Tiso, Al DiMeola, João Bosco and John McLaughlin. His second recording, 1995’s Vivencias Imaginadas, included a refined effort with de Lucia as a homage to Pat Metheny. Two years later, his recording Poeta received the flamenco awards given by the "Premios de la Musica," the Spanish equivalent of the Grammys. In addition to his acclaimed solo performances, Amigo has also accompanied numerous vocalists, including El Pele and Luis De Cordoba and various Spanish dancers. "Making music for so many years has carried me deep into the heart of myself, to the place where I have come to understand what it means to be a fully realized human being," says Amigo. "Music plays a very important part in the world today, and it’s wonderful to be a part of bringing that joy to people. When people listen to me play, they know it’s coming from a very real and truthful place inside me."